It was the 'best birthday' for actress Anushka Sharma, who turned 30 on Tuesday. She is currently in Bengaluru with husband Virat Kohli, who is busy with the Indian Premier League (IPL) tournament. "Best birthday with the bestest, kindest, bravest man in the world. Love you for making it so special my love," wrote Anushka while sharing a picture loved-up picture with Virat. In the background we can see a couple of cakes and bouquets. The day called for double celebration for the couple as Virat's IPL team - Royal Challengers Bangalore (RCB) - also won the match against Mumbai Indians (MI). And yes, Anushka was there in the stadium to support her husband Virat. Anushka and Virat's selfie is now viral and has sent the Internet into a meltdown. Take a look. (Anushka Sharma, hope you had a blast). 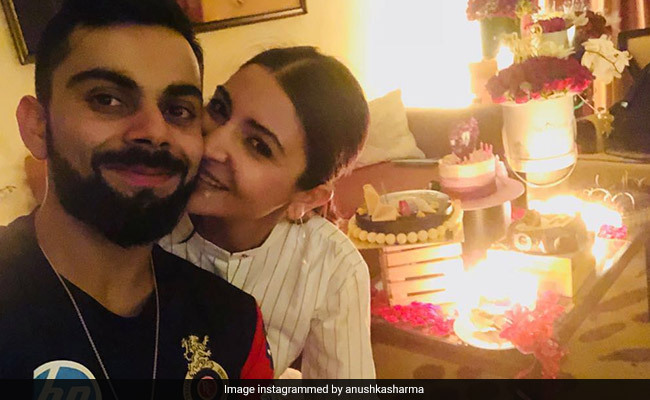 On Tuesday morning, Virat wished his 'love' Anushka with an adorable post and captioned it as, "Happy birthday, my love. The most positive and honest person I know. Love you." Here's Anushka and Virat's picture. The couple reportedly watched Avengers: Infinity War also during the day. Fan clubs have shared their video arriving at a mall hand-in-hand. Anushka Sharma and Virat Kohli are couple goals, right? Anushka Sharma and Virat Kohli married on December 11 last year at a resort in Tuscany. Their wedding was an extremely private affair and apart from both the families, only close friends were invited. They hosted two wedding receptions in India later. Anushka's last film was Pari and now she has Sui Dhaaga, Sanju and Zero in the pipeline.